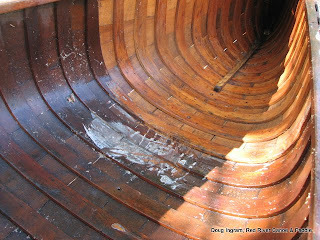 I wasn't going to strip the interior of this canoe. When I starting the varnish it came off too easily for just a surface preparation, but not so easily that I could clean it out thoroughly just by sanding. So, the weather being nice, I got out the stripper and worked outside-the fumes are far less nasty that way! This also gave me the opportunity to use a little pressure washer that I have now. 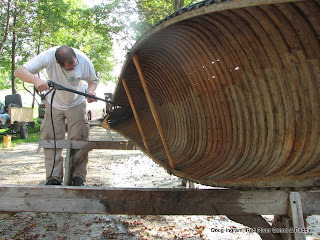 In the past when I have used high pressure water to clean out the active stripper, the pressure was too great and it could rip out softer wood. This little one works better, but it could use more power so that the pressure point is larger. Its still a nasty job, but with the fine weather it was almost pleasant. Before and after, but just the one end. 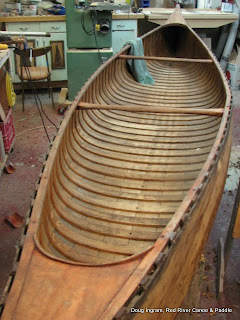 Finish varnish and onto the gunnel repair. Its important to clamp a sturdy piece of wood to the outside and fit in a straight piece of gunnel replacement wood for the interior repair. 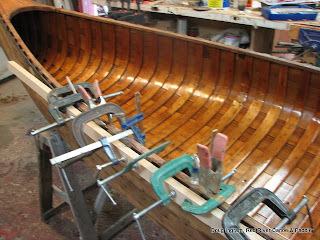 This allows the gunnel to take its proper bend. 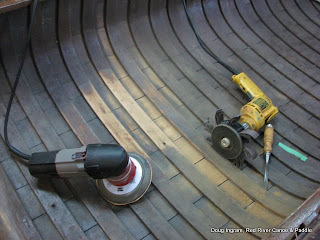 If you try and fit in the repair to the gunnel unsupported, you risk making an unfair curve, and it will be permanent. Posted by Doug Ingram at 8:32 a.m.